The World's Finest playing cards, fit for a King. In 2011, we released the original Monarchs. They quickly became our best-selling deck, and they ushered in a new standard for luxury playing cards. Soon after, we dressed them in red. Monarchs are back in a new print edition, with a much more vivid, vibrant red box. 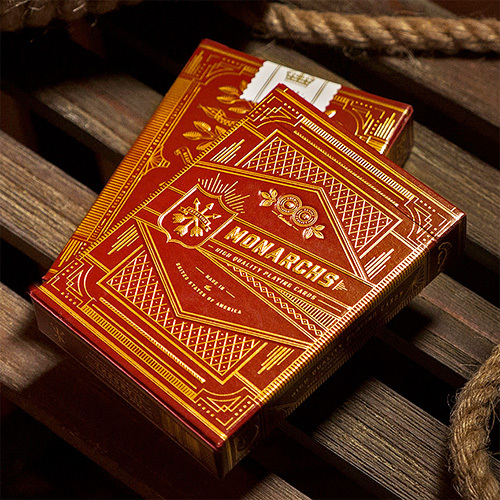 Red Monarchs are Made in the USA on FSC-certified paper derived from sustainable forests. Printed on Q1 quality stock with our signature Premium 909 Finish. We spent time refining the world’s finest deck. It turned out better than we could ever imagine. We treated the back design with a vibrant, dramatic shade of red. For the tuck case, we worked alongside our print team to take an existing soft-touch paper and then darkened the tone while maintaining the vibrance of the red color. The goal was to make playing cards fit for a king. The world’s finest. Regal. We feel one step closer to accomplishing that mission than ever before. We know you’re going to love them. Red Monarchs are the perfect stocking stuffer for design aficionados, poker players, card flourishers, magicians and card-collectors alike. • The deck is poker size.